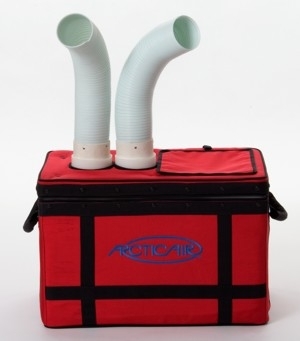 This 52 quart unit features 2 removable ducts. This setup is ideal for placement in the baggage compartment of the airplane. The ducts are designed to be tall enough to get air over the back seats of the airplane. The ducts are fully flexible and easy to remove. This unit features our ballistic nylon outer covering with a hard plastic inner shell for durability. A new louver vent is available that will give you the flexibility to use the air diffuser of your choice. This unit includes a pump out feature that allows you to pump excess water out of the unit with a 6' drain hose by using the unit's built in pump. The unit includes power cord and pump out drain hose. This unit will cool for 2 hours 30 minutes on high cool and up to 5 hours on low cool. The 24 volt model pulls 4.5 amps. Ice & Water: 52 lbs.